I recently received the Meaningful Beauty VoxBox from Influenster to facilitate a review of Cindy Crawford’s Meaningful Beauty Crème de Serum. After years of watching the infomercials—I was pretty excited to give the product a try. How did Cindy Crawford’s Meaningful Beauty Crème de Serum stand up to review? What is Cindy Crawford’s Meaningful Beauty Crème de Serum? First things first—what is this beauty product and what does the product claim to do for your skin? This serum combines a melon complex, anti-aging peptides and hyaluronic acid in its anti-aging formula. According to the product information, this serum is formulated to leave skin soft and help reduce the appearance of fine lines and wrinkles. It is available as part of the Meaningful Beauty New Advanced Anti-Aging System. 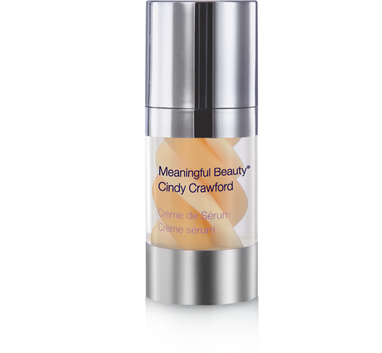 What were my first impressions of Meaningful Beauty Crème de Serum? The package has a nice design and the product pumps well from the bottle. The instructions suggest one to two pumps of the product once daily. I applied two full pumps each morning after using my normal cleanser. The smell is very light and non-perfume-like. The texture has a thick, creamy feel—but, is non-greasy. It absorbed easily into skin and left my skin feeling smooth. My skin is fairly sensitive and I didn’t see any problems with this product from a sensitivity standpoint. Did I see any results from Meaningful Beauty Crème de Serum? The hydrated feel left from this product is not long lasting—I needed to use my regular moisturizer as well. Aside from making my skin feel initially smooth, I didn’t not see any noticeable results in fine line improvement, tone or signs of aging. In defense of the product, it is not sold as a stand-alone product, but as part of the Meaningful Beauty New Advanced Anti-Aging System. I’m not sure if using it longer would generate additional results and cannot say anything for the effectiveness of the entire system. What are my final thoughts on Meaningful Beauty Crème de Serum? Skin needs are quite individual. Personally, I wasn’t impressed enough to switch from my normal skin care routine (which includes a hodgepodge of products rather than a single brand “system”). It’s a little expensive and just didn’t really amaze. You can learn more about Meaningful Beauty Crème de Serum and the brand's other products at the Meaningful Beauty Website. Disclosure: I received a sample of this product in an Influenster VoxBox. All opinions are my own.